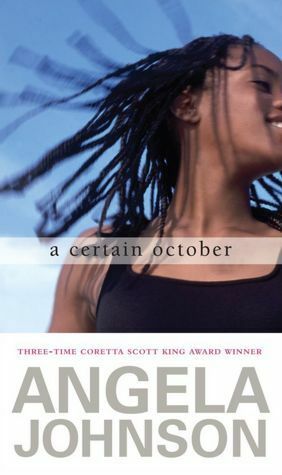 A Certain October by Angela Johnson. Simon & Schuster, 2012. Currently Available. Face Value: This cover is perfect. I love it. I can’t stop looking at it. Were I a librarian or bookseller, this would be one of the books I was constantly shifting position so that it could be standing face out, grabbing attention of potential readers. It looks totally modern, but still classic – it’s not going to seem dated in six months. First, we have a girl, a black girl, a real-looking girl, with braids, on the cover, not obscured or hidden at all. Scotty is the hero of this book and she is the star of this cover. I love the colors and the typeface, and the way they suggest fall without actually having anything to do with fall. I love the emotion on the girl’s face, that hints at the depth of emotion in the book. All publishers should take note of the exquisite crafting of this book. Does it Break the Slate? Yep, this is one of those books that quietly chips away at a slate, when you’re not even really realizing it’s happening. At the start of the book, Scotty sees herself as a side character in her friends lives, “like tofu – it’s what gets added that makes it interesting.” But then, as some terrible and wonderful things happen, we see Scotty start to take center stage in her own life. Who would we give it to? Despite it’s size, this short novel is not a simple book. Like in her previous novels, Johnson doesn’t spell out all the details for her readers, and pushes us to find the depths of emotion hidden between the sparse, elegant sentences. But this is a book that a lot of readers will find resonance in, given the time to find the rhythm of the story. And because it is short – less than 200 pages with plenty of white space on the pages – it might bring in some more reluctant readers. Review: Scotty has always let her world build itself around her, happy to be surrounded by the people she loves, wanting to do everything she can to make them happy. And then her world falls apart. She’s on a train, taking her autistic little brother Keone back home after a doctor’s appointment. Kris, a boy she’s known since childhood is on the same train. The two start talking, and there’s a surprising attraction between them. Kris stays on the train an extra stop to help Scotty with Keone. Then there’s a terrible accident. Kris dies. Keone is in a coma. Scotty, only bruised, is left to deal with the aftermath. Johnson’s writing style is really unique, and I love it. She doesn’t tell us everything – instead she makes us work to get inside her characters heads. But a protagonist like Scotty – totally worth it. I loved this girl. She’s so sincere, so empathetic, and loyal to a fault. This is a girl who will bring fresh boxes of cookies to her brothers bedside, encouraging the nurses to eat them because she “like[s] the idea of Keone hearing cookies munching. That has to be his favorite sound in the world” and a girl who would secretly mail a mixed cd to her best friend to help make something happen with the boy Misha likes. When you like a character this much, it’s easy to root for her throughout the book. “I say it’s like hiccups you can’t get rid of….One moment I was on a train with a boy who I’d ignored since he put gum in my hair when we were six, the next minute I was laughing with the boy who put gum in my hair and the minute after that he’s lying three feet away from me and won’t ever go home again. Half of Keone’s bones are broken. I got bruises and a twisted knee. Lines like that will break your heart, but in such a good way. That’s when Laura smiles real sweet and says – deadly – ‘if I’m not her real mother, I don’t know who the hell is. Then she takes me by the hand and walks off. I’d feel sorry for those people if they weren’t so stupid. They don’t know Laura. And Scotty has amazing friends. Misha, the bold feminist who is simultaneously pleased and exasperated to be placed on Homecoming Court, and Falcone, who’s dealing with his own sadness over breaking up with his boyfriend and worrying about his sister’s potentially abusive marriage, are richly developed characters who are quietly supportive of Scotty, never pushing her away in her grief. Not to mention that having a diverse group of supporting characters embedded into your story makes the whole piece stronger. Scotty’s story is a beautiful one, and Angela Johnson continues to be one of my favorite contemporary YA authors. This entry was posted in Reviews, Young Adult and tagged Angela Johnson, Friendship, Grief, Siblings. Bookmark the permalink.